Today is Word Filled Wednesday and I'm linking up on Internet Cafe Devotions. It's hard for me to even imagine that God rejoices over me with singing. But that's what the Bible says so ...I believe it! That's is such a comforting verse of scripture isn't it!? I love it... and your photo is so serene and lovely. I really enjoyed your WFW, thank you! sweetest verses in the Bible. favorite of so many people. kind of love is simply amazing! Beautiful, Debbie. It makes me rejoice to know that He rejoices over me with singing. One of my favorite bible verse EVER! Singing along with you Debbie!! What a wonderful reflection...the image just speaks peace! Lovely image....that verse just causes me to pause in awe as I try to grasp the truth of it. If there is such a thing as a "power" verse, this is it. All of His Word is powerful but there is something about this verse that just does it for me. Love it! 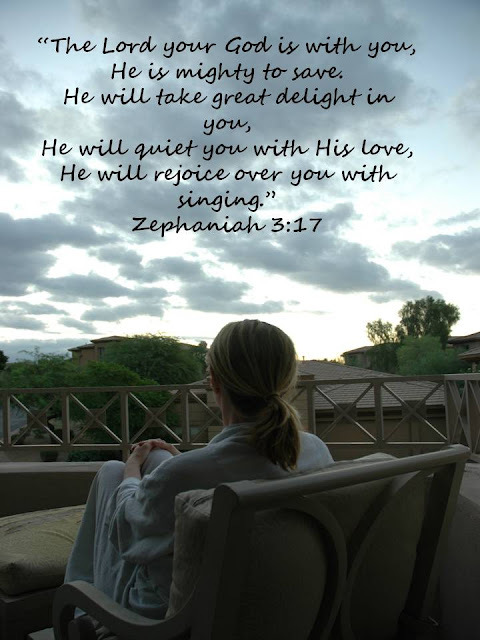 This verse is such a powerful reminder of how much God loves and delights in us, and I do love the words "He will rejoice over you with singing"! Thank you for sharing this today along with your picture as you sit in His presence. like the Random Dozen, I breezed through to arrive here), it's not hard for me to imagine God sitting right there with you, rejoicing and singing His love & peace over you! No, no hard at all. This is just beauty in the peace and stillness. it's time for me to return the singing He has over me. I'm going to turn up some praise music. Thanks, friend. Appreciate your visit and this peaceful pic and precious verse. So beautiful and encouraging... Thank you.. Awesome verse and I especially love the picture!!! Thank you, Lord, for this truth! I always enjoy reading everyone's verses on Wednesday. It's so encouraging. I'll have to participate sometime! That's my second favorite verse and don't I remember that picture from a Psalm 19 post a long time ago--the one where you encouraged me to memorize Psalm 19 and I did! Love this! Very awesome indeed. And extra encouraging as it reminded me of the lovely praise and worship music from church - Our God is Mighty To Save. Thank you for a lovely Word-Filled Wednesday. he is a blessing! Amen! He is beyond awesome sis.